Here’s a video that discusses concussions and the necessity of reporting head injury symptoms right away. Athletes are often taught that they have to “tough it out” when injured, but unlike many other injuries, playing with a concussion can cost an athlete their entire season…or their career. I like this video – because it’s the personal story of a female basketball player, it shows that concussions can be experienced by anybody in any sport, not just by males in contact sports such as football or hockey. Coaches everywhere, you don’t need the most talented team in the world, nor do you need to be the biggest school in your area to be successful and make a legitimate run when it comes to playoff time. All you need is a team of hardworking individuals who buy in to your concept and are willing to sacrifice for the greater good of the team. To people watching sports, never sleep on the little team that could. 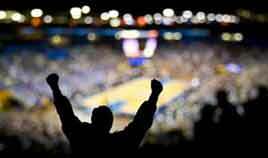 Take Florida Gulf Coast in the NCAA basketball tournament this year. Anyone who says they knew about this school before this year is either from Florida or lying. Now, everyone is talking about them and for good reason. They became the seventh 15 seed in NCAA history to upset a two seed and the first 15 seed ever to make it to the Sweet Sixteen. This teams rise has been something out of Hollywood, think Hoosiers but more athletic. The Eagles have only been eligible to compete in the NCAA tournament for four years; their coach is a self-made millionaire who gave it all up for a coaching stint at Florida Gulf Coast. The best player on the team is named Sherwood Brown who started his career as a walk-on. They upset number two Georgetown, a team boasting more size and athleticism, by simply running them off the court. It’s too bad “Lob City” was stolen by the LA Clippers because that would be a fitting nickname for this squad. Phenomenal alley-oops and put back dunks are a staple in this team’s offense. It was same story, just a different versus against San Diego State the number seven seed. Setting the tables for the most unexpected rivalry game in recent memory as Florida Gulf Coast was set to play Florida in the Sweet Sixteen. Interestingly enough, Florida Gulf Coast had requested to play Florida at the beginning of this year and had been turned down. Bad move Billy Donovan, I suspect that will no longer be the case. Alas it finally struck midnight for this Cinderella as they were beaten by cross-state juggernaut, Florida. This cannot take away from the unexpected run that captured a nation’s attention and made every small school believe that, given the opportunity, in a one-and-done situation, that anything is possible. Ian Morse is a former player with the Laurentian University and Cambrian College basketball teams. He’s about to graduate from the Cambrian College journalism program. The NCAA basketball championship concludes tonight, and with it, one of the most enjoyable spectacles in sport. To me, this three-weekend playoff is much more exciting than it’s professional counterpart. Here are my top-three reasons why the NCAA tournament is better than the NBA playoffs. The sudden-death format creates a sense of urgency that makes players go all-out, all-game! No coasting, no “we’ll get them next time.” Plus, players who are trying to make it seem more motivated than players who already have millions in the bank. The referees actually call fouls – particularly traveling and offensive charging. The NBA brain trust is so concerned about keeping scoring levels high that they feel it’s OK to allow an extra step when attacking the basket. It’s OK for big men like Shaq to bowl over a smaller opponent if it ends in a basket. And a charge is seldom called under the net – that would reduce the number of slam dunks in a game. And that seques into the final reason I enjoy the NCAA tournament so much. The teams play defense. I enjoy watching players who work their butts off on “D.” And I love watching teams struggle to crack and opposing defensive scheme. The games I enjoy the most may involve only 50 or 60 points. When baskets have to be earned, they have more value. NBA officials…wake up. The pro game is so slanted towards the offence that baskets mean very little. Games in which teams score 120 points aren’t as much fun to watch as you think. Soccer, hockey and baseball have all managed to survive without triple-digit scoring! To me, pro basketball is the Hollywood version of the game. The NBA feels that reality isn’t dramatic enough, so they shade the rules to embellish the more specatacular elements of the sport. In fact, they’re wrong. I’d rather watch the real thing. And millions of NCAA basketball fans obviously feel the same way! One of the primary goals of any physical education program is the development of our students’ ability to maintain an active lifestyle throughout their lives. I’m the beneficiary of my own school experience in PE and sport. I still play a weekly game of old-man’s basketball – in my old high school gym with some of my old high school schoolmates – in a ritual that has been part of that school since the mid-1960’s. The youngest in our current group is about 18. But we have two players in their sixties, with the oldest still fast-breaking and hitting the boards at 65. He still has quick feet, a good jump shot and is perhaps the most aggressive player on the floor. We think the pacemaker he had installed three years ago has given him a mechanical advantage. So, when I heard about Ken Mink, I wasn’t surprised. Ken is a 73-year old grandfather of six, who, after retirement from the newspaper business, realized he had some unfinished business. On the basketball court, that is. In 1956, he was kicked out of junior college for an act of vandalism that he didn’t commit. It seemed to be the end of his basketball career. But he obviously stayed fit and maintained his skills. So, retired and with time on his hands, he enrolled in some courses at Roane State Community College, in Tennessee, and tried out for the varsity basketball team. His enlightened coach, 50-year old Randy Nesbit, had an interest in the possibilities of athletic performance in older people. He gave Ken a shot, and Ken made the team. He now plays between five and eight minutes a game, and his opponents don’t take it easy on him. Nobody wants to be the player who let a 73-year old score on him. 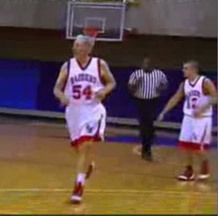 And in November of 2008, Ken Mink set a Guinness World record, becoming the oldest-ever player in collegiate basketball history to score a point. In fact, he sunk two points, on free throws, after getting fouled while pump-faking an opponent. And as I’ve pointed out, Ken Mink isn’t the only senior basketball player out there. How about 77-year old Don Morris of San Luis Obispo, California, who shot 84% in the free-throw competition at the recent senior Olympics California state championships, winning a gold medal. Eighty-four percent! Shaq, give this guy a call. The point is, students should be made aware of the Ken Minks and Don Morrises of the world, so they know that sport and fitness isn’t just something they do now…it’s something they do for the rest of their lives. (Ken is deadly from 10-15 feet with his set shot). (Also describes his mental cues for foul-shooting). Welcome to 2009. I’ll see you in two weeks! I play in one or two old-men’s basketball tournaments a year (known by the more politically correct as masters basketball tournaments). They are a lot of fun, and are a great way for us over-50 codgers to get a competitive fitness hit. You CAN play basketball without having to actually, run, jump or get back on defense. Masters players pass the ball much better than young fellers. Mainly because it’s easier than running! Long fast break passes, however, are usually accompanied by an “ouch” or groaning sound of some sort. Few masters players wear baggy shorts that come down below the knees. Takes too much energy to lift the knees…if we ever get into a situation in which knee-lifting is required. The older the player, the less the feet move on defense, but the harder the hand-checks become. Driving the hoop against a really old player is like running through a threshing machine. Unlike high school players, masters players often don’t WANT to get off the bench. Pre-game nutrition is a different animal. For example, the pre-game breakfast of one of our players this year comprised a plastic container of cold, leftover, hot-sauce chicken wings that had laid on his hotel room floor all night…washed down with some hotel-room coffee. A pre-game meal, by another teammate took place during our normal warmup period and consisted of a club sandwich, fries and a beer. For some reason, he felt sluggish during the game that started 20 minutes later. Apparently, the lifespan of a masters players basketball shoes is 20-30 years. Those sissy high schoolers want a new pair every year! Masters basketball can indeed be a different game. Ninety per cent of us have realized that we may not make the NBA, but the game keeps us fit and happy and provides a great reason to get together. Having the skills to play, even as we age, is one of the fruits of the physical education and school sports programs we experienced when we were young. And providing the opportunity for such play for future masters “athletes” is definitely one of the goals of today’s physical educators. Keep up the great work, everybody! 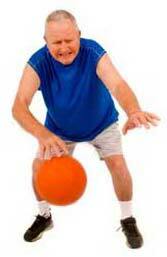 I play old-men’s pickup basketball with a crew that meets every Tuesday night during the winter. Our oldest members are in their 60’s and have been partaking of this weekly ritual for decades. But there are also some younger guys in their 20’s who play with us. Of course, there is some friendly trash-talking about old men and their ability to play the game (usually coming from the old men themselves). So, when I came across this video, I immediately sent it to my crew (immediately after I stopped laughing, that is). It shows rookie NBA sensation Kyrie Irving in an amazing makeup job that makes him look like he’s in his 60’s or 70’s. When a player in a game of playground basketball gets “hurt,” Kyrie is convinced to take his place. The opponents are a group of cocky 20-something hotshots who don’t like the idea of playing against an old man. The results are hilarious and some of “Uncle Drew’s” moves are amazing. I’ll be trying them all next year (not!). I don’t know how many of the people in the video were aware that it was a setup (I’m pretty sure I saw NBA great, Clyde Drexler, standing on the sidelines), but it’s funny regardless. And for you PE teachers and basketball coaches who have to listen to trash talk from your students about your declining hoops skills – well, send them this video! P.S. This is the final blog before the summer holidays. There won’t be a blog over the summer (who’s going to read it anyway), but we’ll be back in September. Have a great summer vacation! And as you can see, we’re experimenting with a new, cleaner look for the blog. When you come back next Fall, we should have it finalized. I hope you like it.